A wooden privacy fence can be effective at hiding a concrete block wall. Determine the number of furring strips you need by measuring the length of the wall where you're building the fence in inches and dividing it by 24. (The furring strips will be placed 24 inches apart.) Cut pressure-treated 2-by-4s to match the height of the privacy fence with a circular saw. Measure and mark the cut line on the boards and place them on a workbench or across sawhorses. Set the depth of the saw blade so the bottom is an eighth-inch beneath the boards, then line up the blade with the cut line and make the cut. Don't lay the part of the board you're cutting over any other objects and wear safety goggles when cutting. Use a hammer drill with a carbide-tipped masonry bit to drill pilot holes into the cinder block wall where you are installing the furring strips. Drill a hole every 12 inches, staggering the holes slightly to help prevent the wood from splitting. The bit should be the same size as the concrete sleeve anchors. Clear the holes with a wet-dry vacuum or a wire brush to remove any debris. Drill holes through the furring strips for the concrete sleeve anchors. One way to match up the holes on the furring strips with the holes in the cinder blocks is to slide the sleeve anchors into the holes, paint the nuts on the sleeve anchor bolts, then press the furring strips up against the nuts. Drill the holes through the paint marks on the furring strips. Place the furring strips into position against the wall and slide the sleeve anchors into the holes. Use the wrench to tighten the nuts, securing the studs against the wall. 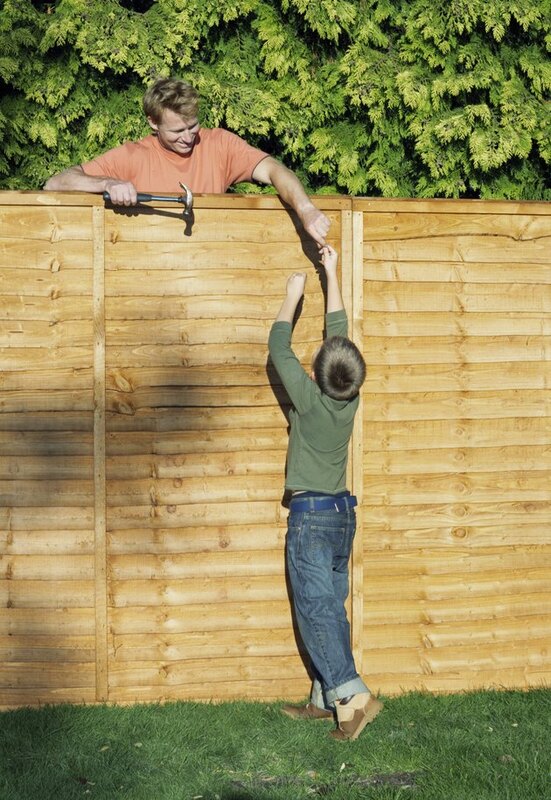 Build the fence by screwing the fence rails to the cleats, with the top rail about a foot beneath the top of the fence and the bottom rail about a foot above the bottom. Use galvanized screws to secure the fence panels to the rails, using the drill and screw-head bit.